A Division Bench of Madras High Court on Monday directed the Bar Council of Tamil Nadu and Puducherry to revoke suspension of seven out of eight advocates against whom disciplinary action was taken for disrupting the functioning of CISF within the Court premises. Observing that the disease of Court boycott and confronting judiciary is at such an advanced stage that surgical procedure alone is the solution, the Bench comprising Justice V. Ramasubramanian and Justice K. Ravichandrabaabu refused to declare that the revocation order was arbitrary in nature. The Court also made it clear that the order would only apply to the lawyers before it, and not to the others facing suspension. The Court however observed that the strictness of the Bar Council of India and State Bar Council has been effective in restoring some level of discipline in the Court. It noted that for the first time in the past ten years, all the courts in the State had functioned without a day’s boycott for over six months. “One good thing that has turned out of the entire episode, is that the lawyers, who preferred to issue boycott calls at the drop of a hat, have taken recourse to legal remedies,” the order reportedly stated. The lawyers were barred after they had staged a protest, claiming that a CISF personnel in plain-clothes had made a video of the frisking of a woman advocate by a plain clothed woman personnel on November 20. They were reportedly found to be indulging in unruly conduct, intimidation, obstruction, wrongful restraint of CISF personnel and destruction of public property, and using abusive language. In a separate communication to the Registrar General, the CISF Commandment had submitted a copy of a complaint given by a lady CISF Sub Inspector. He had also lodged a police complaint for alleged offences under various sections of IPC read with Section 3 of Tamil Nadu Public Property (Prevention of Damage and Loss) Act, 1992, against all the lawyers. Hearing their petition, the Court noted that the lawyers had been debarred for more than 100 days now and had filed affidavits assuring that they would not disturb lawful functioning of CISF in the Court. It observed that the cases against them fell in the category where the alleged misconduct is “somewhat palatable that the suffering already undergone by them is sufficient for revocation of interim suspension.” It also took into consideration the request put forth by the petitioners that the Disciplinary Committee of Karnataka Bar Council be directed to complete the enquiry and pass final orders within a timeframe. The Bench thereafter directed the enquiry to be completed within six weeks. 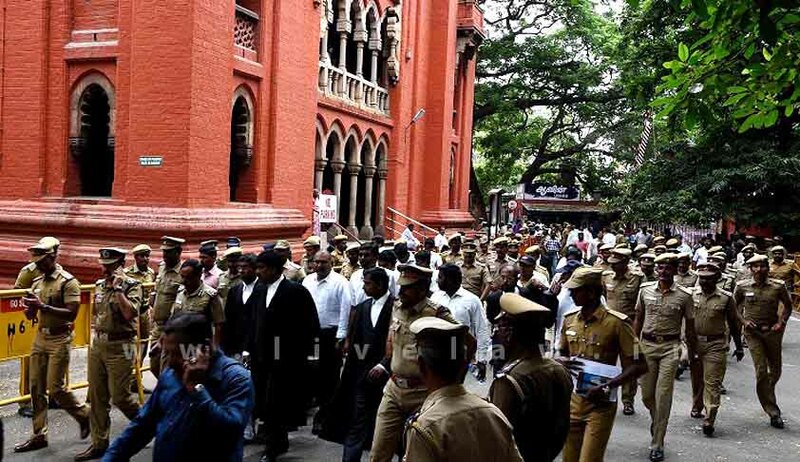 In September last year, a group of lawyers and ‘civilians’ had staged a sit-in protest inside the court hall demanding conduct of proceedings in Tamil. Madras High Court had then taken suo motu cognizance of the incident. It had directed the State Government to take action against the continued disruptions being witnessed within the Court premises and initiate declaration of the High Court as a High Security Zone. It had also demanded that the High Court, Principal Seat as well as the Madurai Bench be brought under the security cover of Central Industrial Security Force (CISF) or any other similar force. You may read the LiveLaw story here. Aggrieved by the decision, the State Government had then approached the Apex Court. The Court had however dismissed the petition saying “The Chief Justice (of the High Court) and judges are entitled to say that the police is ineffective. You cannot allow the institution to be held to ransom. We will not allow this to happen.” You may read the LiveLaw article here.